With a land area of only 51.100 km2 (0.03% of the planet’s surface) and 589.000 km2 of territorial waters, Costa Rica is considered to be one of the 20 countries with greatest biodiversity in the world. Its geographic position, two coasts and a volcanic mountainous system provide numerous and varied microclimates explain this natural wealth, both in terms of species and ecosystems. The more than 500,000 species that are found in this small country represent nearly 5% of the total species estimated worldwide. 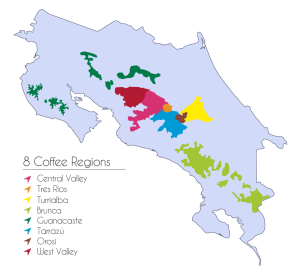 Coffee production in Costa Rica began in the late 1700’s in the Central Valley, which had ideal soil and climate conditions for coffee plantations. Coffee Arabica was introduced to the country directly from Ethiopia. In the nineteenth century, the Costa Rican government strongly encouraged coffee production, and by 1821, at the time of independence, Costa Ricans had already realized the value of coffee as an export product and as an opportunity that permitted farmers to release themselves from the poverty conditions in which they had previously subsisted.